QUEENSTOWN JETBOAT, GLACIER HELICOPTER RIDE, MILFORD CRUISE. "What I find is that you can do almost anything or go almost anywhere, if you're not in a hurry. "Paul Theroux in The Happy Isles Of Oceania: Paddling the Pacific. For adventure, we did the three cliches of any South Island excursion: the jetboat ride at Queenstown, the helicopter tour of the glaciers complete with snow landing, and the cruise to Milford Sound. 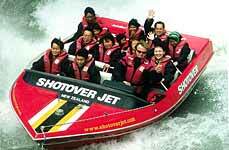 A jetboat is basically a Formula 1 racing car on the water. And the drivers are all obviously on drugs. After five minutes on the thing, you will be asking yourself, "What the hell was I thinking?!!" Because we had two kids along, they placed us right at the back, as if that was going to be any safer. The driver speeds along a stretch of the Shotover River, at breakneck speed, then attempts to crash the canyon walls. Every now and then, he points his index finger in the air, and makes a circle, the signal for a 360-degree spin. Throughout the one-hour ride, there is little to do, but scream. Just to get a rough of idea of G-forces hitting your face, Julian lost his glasses when he turned to check whether Jordan was still on the boat. Luckily he had packed a spare. And yes, Jordan, was still there - screaming his head off. Andrea, our little heroine, survived it with little incident. Earlier, on the west coast, we took off to the air on a helicopter ride, that was no less thrilling. We were off to see the Franz Josef and Fox glaciers, near Mount Cook, New Zealand's highest peak. A glacier, in case you missed that geography class, is a massive river of ice that is a relic of the Ice Age and still advancing towards the sea. But the Maori story was more fun to hear. Early Maoris called the twin glaciers Ka Roimata o Hinehukatere - The Tears of the Avalanche Girl. As the story goes, Hinehukatere loved climbing in the mountains and persuaded her lover, Tawe, to climb with her. Tragically, Tawe fell from the peaks to his death and a broken-hearted Hinehukatere shed many tears, which eventually froze to form the glacier. Not wanting to suffer the fate of Tawe, we opted to fly. We got a grand view of the Southern Alps, and soared over the glaciers -- incredible white fields of snow pocked with surprising blue hues. The pilot said the blue was from pools formed from all the rainfall in the days before. We landed on top of a snow-covered mountain and had a walkabout. The kids were ecstatic - jumping, kicking and stomping and rolling in the snow. Jordan, who is usually discouraged from taking cold drinks and ice back home, must have thought he was on ice heaven. He was chomping on it, and even picking it off of his shoes and popping it in his mouth after we returned to the helicopter. The pilot was kind enough to take pictures for us and pointed out the coming squall in the distance, suggesting how lucky we were. Mount Cook was obscured by the clouds but we didn't mind. It was great just chucking snowballs at each other. 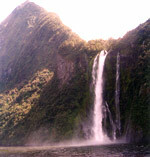 Milford Sound is perhaps NZ's most famous tourist attraction. The cruise takes one through a waterway surrounded by grand hills and waterfalls out to the Tasman Sea. If the cruise doesn't impress you, the drive there and back from Te Anau certainly will. The drive there turned out to be one of the most scenic of the journey, and we were reminded of a few scenes we had glimpsed in The Lord of the Rings trailer. With the trees canopying the road in stretches and the innumerable waterfalls streaming down the mountains, director Peter Jackson had well-chosen his Middle-earth. At one point we drove down Homer Tunnel, a pitch dark, cavernous hole that you can actually hear trickling water in. There were no cars in front or behind for awhile, and our headlights were little compensation in the darkness, until thankfully, the tiny light at the end of the tunnel emerged. The cruise itself was memorable if only for the fact our kids sat below deck almost throughout colouring a picture of the boat we were on. At one point the boat pulled up close to waterfalls so we could feel its cool cascade, which impressed Jordan and Andrea enough to come top deck. On the drive back to Te Anau, we stopped a number of times to take in the amazing landscape of waterfalls all around us. Outside Homer Tunnel, the inquisitive kea birds, huge green alpine parrots, bugged us enough to part with some biscuits. Accommodation in the South Island was far roomier than the north for similar prices. At Mount Vernon Lodge, in the former French settlement of Akaroa, off Christchurch, we had the luxury of a whole cabin complete with kitchen to ourselves. 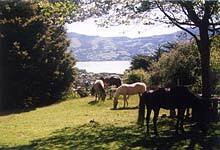 Horses grazed outside our cabin, and the kids got guided rides from the manageress Cathy. They even had a barbecue with huge helpings one night for a nominal fee. At Te Anau, we also got a whole cabin, minus kitchen, at Barnyard Backpackers, situated atop a hill overlooking a deer farm. We had to walk downhill to cook at the main building, but we didn't mind so much for the views and incredible freshness of the morning. The manager's daughter took our kids for free pony rides. In Greymouth, on the west coast, we stayed at Global Village, a backpackers place we definitely recommend. It has a colourful, tribal theme and a worldly-wise British host named Andy who served great-smelling, freshly baked rolls and bread with fabulous jams in the morning, and even cakes for tea. At Wanaka, between the glaciers and Queenstown, we stayed at The Purple Cow, a really clean and incredibly popular backpackers with individual toilets in every room. The dining area faced the lake and had a huge lounge window that was a living postcard. This laketown held a special place in our hearts for its breathtaking views and amazingly clean lake. Up in Ivory Towers, at the little village at Fox Glacier, we had a family room with comfortable beds and a bathroom with huge glass windows that opened out to a forestry hillside. When you had a bath you had to hope no one was watching!